For the Hopi, the word kachina (katsina) refers to three distinct but related entities: the invisible spirits who are an essential part of Hopi life, the personification of those spirits in ceremonial dances, and the carved and decorated dolls that the kachinas give to infants and women. Kachinas serve as intermediaries between the supernatural and human realms. They are generally bringers of clouds, rain, and all good things. Kachinas (katsinam) present themselves in our world for the annual period falling just after the winter solstice and concluding after the summer solstice. For the remainder of the year, these ancestral spirits occupy an underworld accessed through the sipapu, or vertical entranceway. Young Hopi women wear tabletas on their heads in social dances, such as the Butterfly Dance. 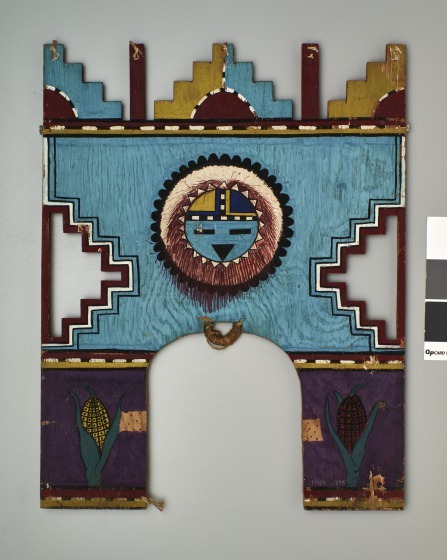 This tableta features ears of red and yellow corn below a central sun kachina face. Stepped cloud and lightning designs frame the top panel. 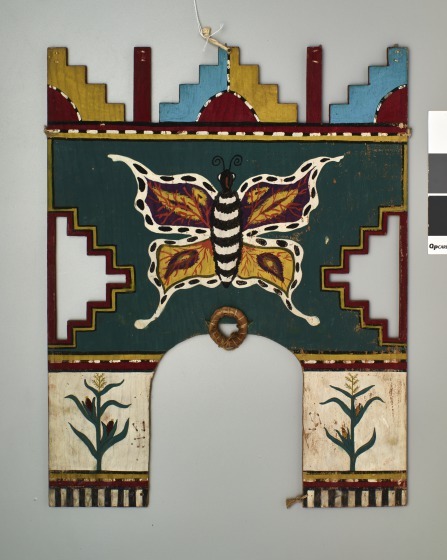 Notably, this panel utilizes yellow, red, white, and green/blue, the four directional Hopi colors. 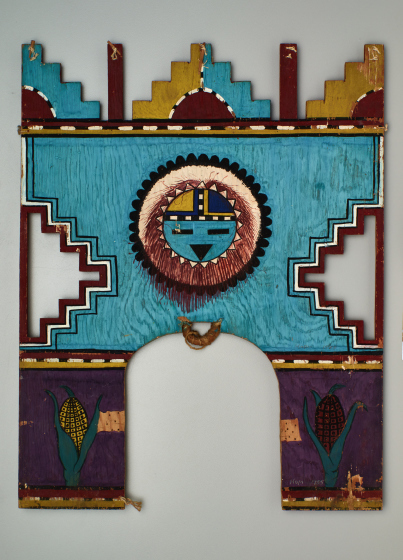 Kimberly L. Jones, PhD, Hopi Visions: Journey of the Human Spirit, Gallery text [Kachina (katsina)], 2018. Kimberly L. Jones, PhD, Hopi Visions: Journey of the Human Spirit, Label text, 2018.